In 1907, when the industrial revolution in Japan had almost reached its peak, Hatsudoki Seizo Co., Ltd., the predecessor of Daihatsu Motor Co., Ltd., was founded in Osaka. The foundation was planned by academics, including Dr. Yoshiaki Yasunaga, Head of the government-run Osaka Higher Technical School (present-day School of Engineering, Osaka University), based on their belief that the true industrialization of Japan required the domestic production and spread of internal combustion engines. 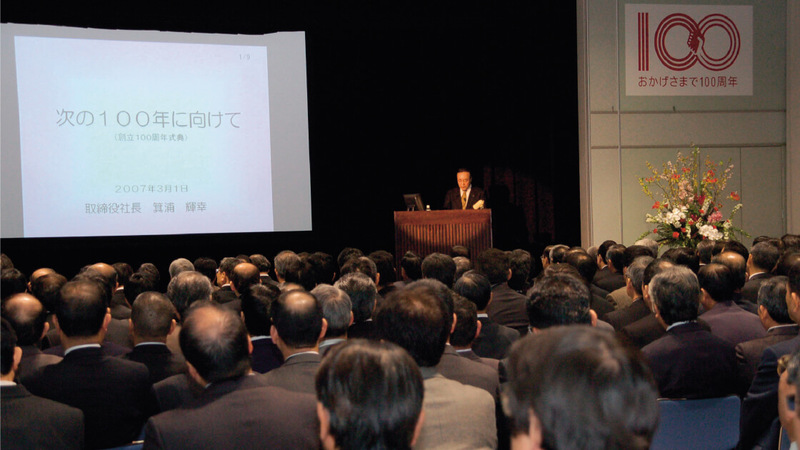 People in the business world in Osaka shared the academics’ belief and offered cooperation in founding the company. The foundation of a company through industry-academia partnership was exceptionally rare at that time. 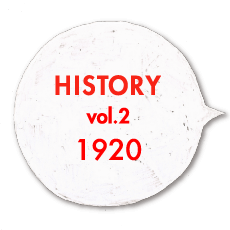 The general foundation assembly held on March 1, 1907 elected Saneyasu Oka as the first Senior Managing Director, the top management member at that time, and other executives. After that, construction works for the new company’s shops and other buildings were begun in an area near Osaka Station. In September of the same year, the buildings were completed, and the company started operating with about 70 workers. 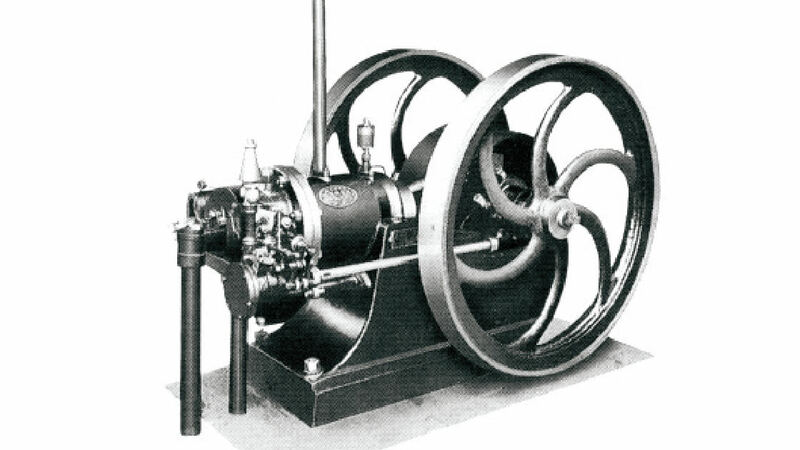 Although imported real internal combustion engines existed in Japan, neither designs nor documents concerning such engines were available at that time. Therefore, the engineers had to devote themselves to research day and night, and confronted an endless series of difficulties. 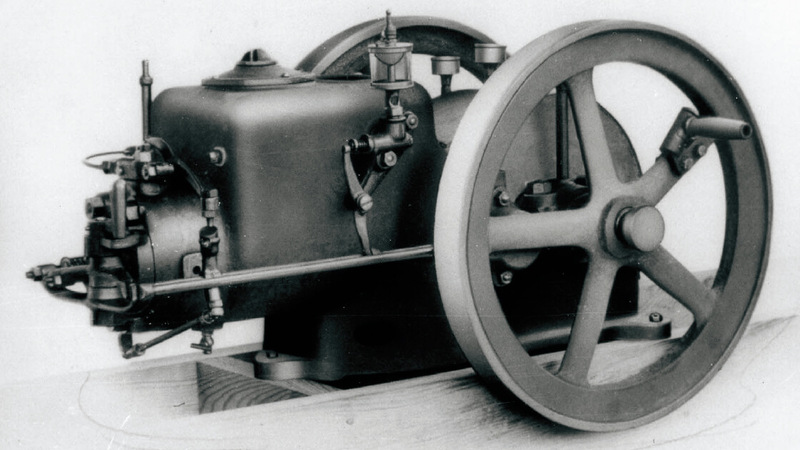 In December 1907, they finally carried out a trial test of a suction gas engine, and decided to unveil it in motion at a general meeting of shareholders planned soon after the test. However, it took a long time for them to turn on the engine. As some attendees began to leave their seats, a loud engine sound eventually echoed around the venue, drawing enthusiastic applause from the shareholders. 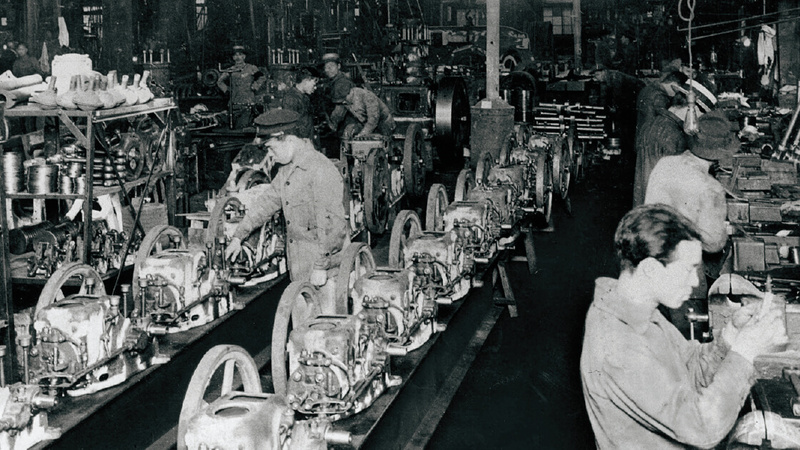 This moment marked the completion of the first nationally made 6-horsepower suction gas engine. Succeeding in boosting the power of the engine, the company delivered 100-horsepower electric power generation engines in 1908, and also entered the marine engine market in 1909. Increased support from the industrial world led the company to achieve a net profit as early as the term ending in May 1908 (a six-month term was adopted at that time). To establish a management system suitable for the company’s expanded businesses, in December 1911, the board of directors meeting decided to introduce a president system, and appointed Senior Managing Director Yukuma Kurokawa as the first President. During the transition from the Meiji Era to the Taisho Era, growth in orders forced the company to increase production by expanding its plants over the four years from 1915. 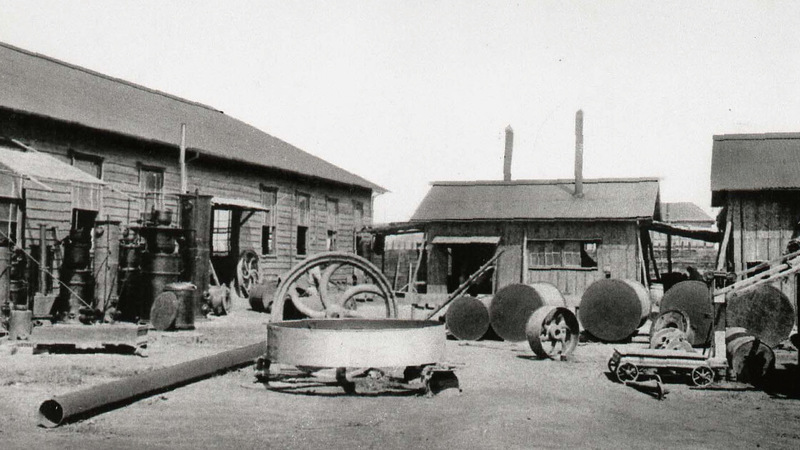 The area of the expanded plant site, as of 1919, had approximately doubled from the time of the company’s foundation. During the period, the company entered the marine steam engine market and delivered its first marine steam engine for a cargo ship in 1917, while striving to further increase the power of its suction gas engine. The company steadily put into practice its founding philosophy: Contribute to industry-based national development through the domestic production of engines. In the 1920s, with the transition from the Taisho Era to the Showa Era, the Japanese economy was in great turmoil. The Great Kanto Earthquake occurred in 1923, and a crash in stock prices in the New York market plunged the world into the Great Depression in 1929, catching the Japanese industrial world in a predicament. 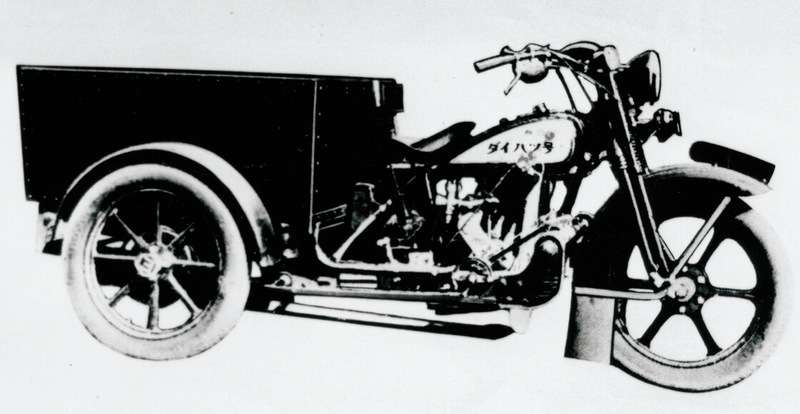 To overcome this difficult situation, the company explored new fields, such as railroad car brakes and compact diesel engines (product name: Super Diesel), and succeeded in newly developing an air-cooled four-cycle gasoline engine for motorcycles in 1930. The company had set about the development project against a background at that time of an increasing number of small-scale enterprises beginning to produce small three-wheeled vehicles with imported motorcycle engines. As in the company’s early days, with no designs or references data available, engineers drew designs based on imported engines and made engines on a trial basis over and over again. 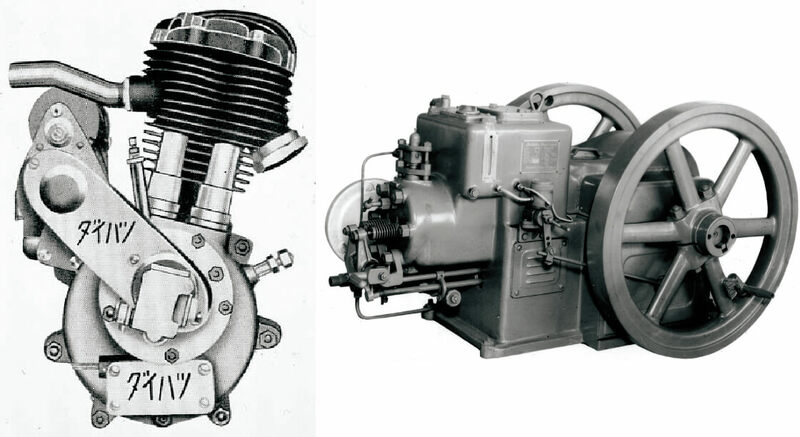 The company’s first motorcycle engine, completed in 1930, had a 500 cc displacement, and received a high reputation as “equivalent to or better than engines produced abroad” at an industrial fair held by the Ministry of Commerce and Industry in the summer of the same year. However, since the public trend toward blind faith in imported products prevented domestic products from receiving proper recognition, The company’s engines also failed to appeal to three-wheeled vehicle manufacturers. Then, the company decided to begin manufacturing small three-wheeled cars with their own engines. The company completed the Model HA Daihatsu vehicle in December 1930, and launched the improved Model HB, as the company’s first consumer vehicle, onto the market in March 1931. This marked a major turning point for the company in the shift from an engine provider to an automobile manufacturer, as well as for the Japanese automobile industry in beginning to modernize three-wheeled vehicle production, which had been conducted only on a small scale. From 1933 onward, the company provided a wider variety of three-wheeled vehicles in terms of engine, body type, loading capacity, etc., and manufactured 5,122 three-wheeled vehicles in 1937, surpassing the 5,000 figure for the first time. The company first used the term “Daihatsu” in its product names in 1930, when it entered the three-wheel vehicle market. The company also named the diesel engine launched in the same year the “Daihatsu Diesel Engine.” The term “Daihatsu” had been originally coined by customers as an abbreviation for “Osaka-based engine (‘hatsudoki’) manufacturer.” (The kanji character for “o” in “Osaka” is also pronounced “dai.”) In December 1951, after WWII, the company was renamed Daihatsu Motor Co., Ltd. In Japan after WWII, three-wheeled vehicles spread rapidly. In response to requests from users, manufacturers launched a wider variety of, and larger-sized, three-wheeled vehicles onto the market. As a result, three-wheeled vehicles became similar to small four-wheeled vehicles in performance and price, while losing their distinctive features. Meanwhile, domestically produced two-wheelers mainly for freight use came onto the market, but their disadvantage lay in their limited loading capacities. 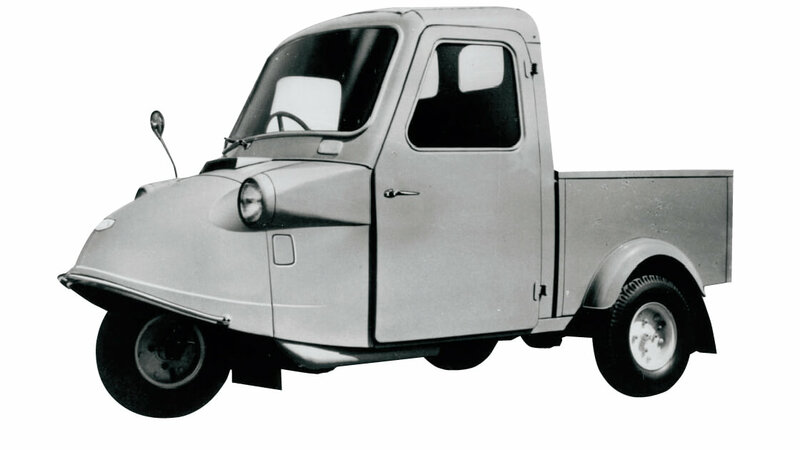 Targeting the potential niche between the three-wheeler and two-wheeler markets, Daihatsu released the mini three-wheeled truck the Midget in 1957. 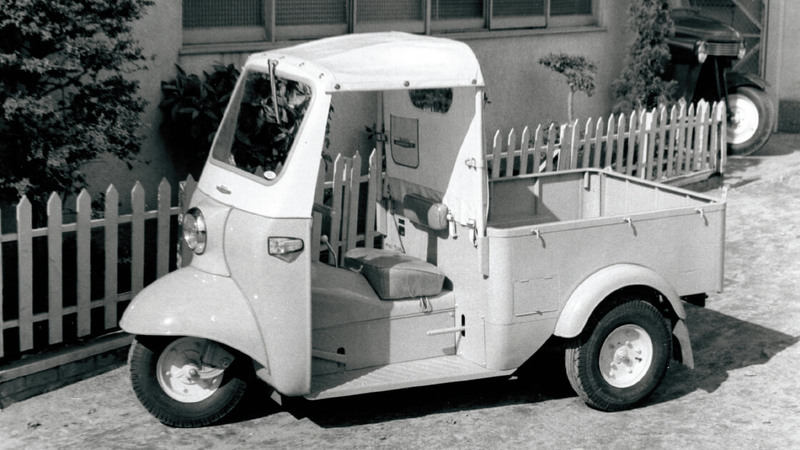 Under the concept of “easy-to-handle, economical vehicles that can easily make tight turns,” Daihatsu started developing mini three-wheeled trucks on a full scale in 1953, and completed the first prototype with an engine and body specially designed for it at the end of 1954. At the same time, the company conducted marketing research mainly on two-wheeler users, analyzing their dissatisfaction with two-wheelers and small three-wheeled vehicles. In 1956, the company set about the final design by incorporating the results of the marketing research, and eventually launched the Midget onto the market. The first model of the Midget, the Model DKA, had a 249 cc engine, a loading capacity of 300 kg, and a handlebar, and although the monthly output target for the model was originally 500 units, its actual monthly output in August 1958, the year after its release, reached about 800 units. From 1959 onward, Daihatsu made improvements to the model, introducing a two-seater cabin and a driving wheel, and expanding the loading capacity. As a result, the model became a massive hit opening up the new frontier market for mini three-wheeled trucks. In September 1960, the total number of registered vehicles of this model exceeded 100,000 in the aggregate, and the number of vehicles of this model newly registered in the same year amounted to 86,000. The company also began to export the model to Southeast Asian countries, such as Thailand, in 1959. The factors behind the popularity of the Midget included its remarkable mobility, low price, and simple nature as a vehicle requiring only a mini-car driver’s license, and the immense help of commercials on TV, which were rapidly spreading at that time. A humorous commercial, featuring the popular comedians Kon Omura and Juro Sasa, was broadcast from 1958, disseminating the name of the Midget around the country in a flash. The company also made steady sales promotion efforts, such as sales training programs, which aimed to fully share knowledge about the product with the sales staff, and the publication of the Midget Photo News, resulting in remarkable achievements. 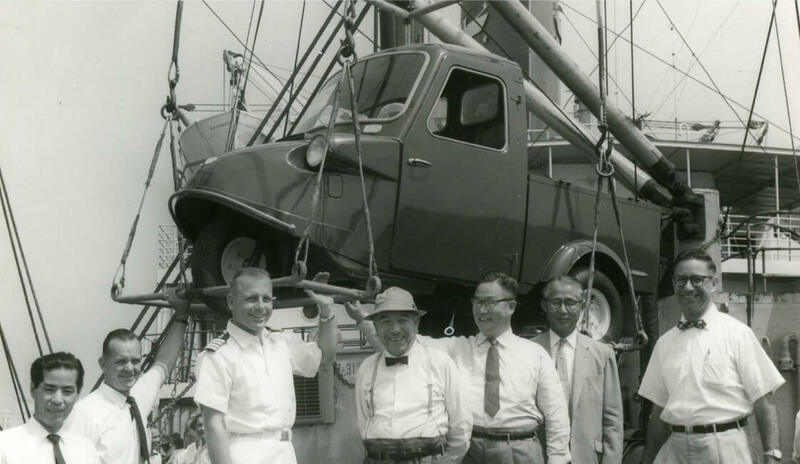 To prepare for the release of the Midget, in 1957 Daihatsu established a Mini Three-wheeled Vehicle Sales Section, which drew up contracts with dealers, sales manuals, and other documents. 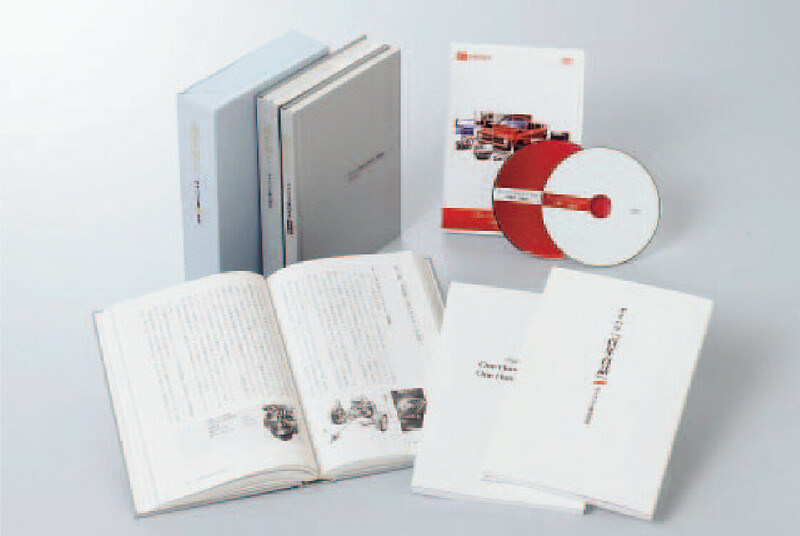 In an age when importance was often placed on personal relationships of trust with dealers, rather than contracts with them, this approach taken by Daihatsu marked a watershed in the modernization of sales and marketing systems, including after-sales service. In the 1960s, the Japanese automobile industry reached a major turning point: the successive liberalization of trade and capital caused Japanese automobile manufacturers to face serious competition with rivals abroad. The proposal made by the Japanese government at the end of 1962 on a reshuffle of the automobile industry through the concentration and merger of passenger car companies accelerated business alliances, mergers and other measures. To enable the company to win in global competition, the Daihatsu management also actively discussed a business alliance with a company that would support Daihatsu and explored several options. 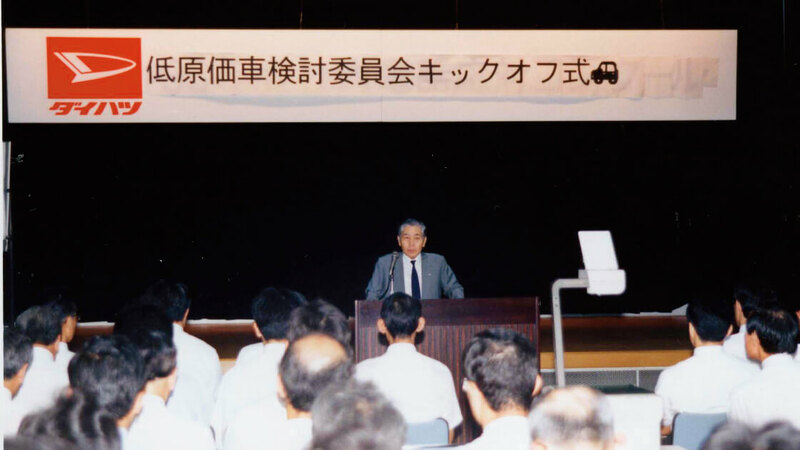 As a result, based on the judgment of President Koishi, it was decided that Daihatsu would become a member of the Toyota Motor Group (led by Toyota Motor Co., Ltd. and Toyota Motor Sales Co., Ltd. at that time). 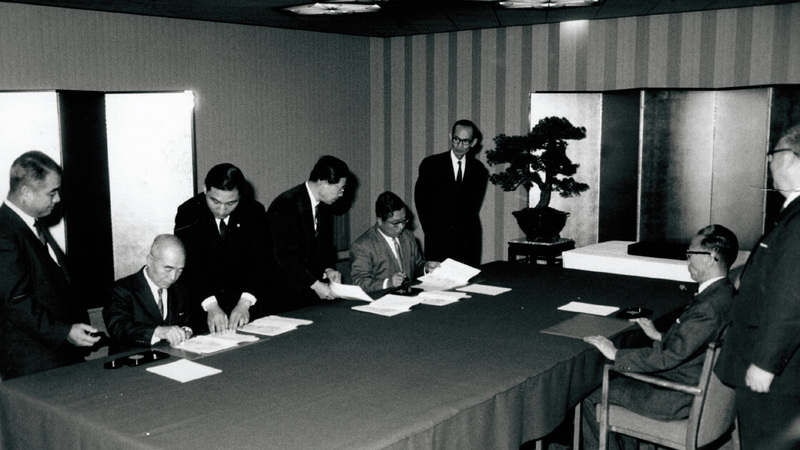 After about one year of talks among the three companies’ top executives, the parties signed a memorandum on a business alliance and issued a joint statement in November 1967. 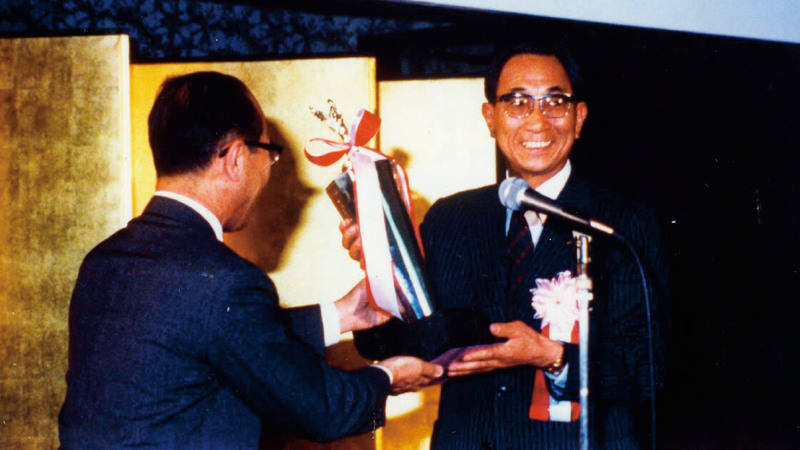 In the year that marked the 60th anniversary of Daihatsu’s foundation, a key decision was made with a view to the company’s further growth. The joint statement said: “The upcoming era of the full-scale open global market urgently requires the Japanese automobile industry to strengthen its structure and competitiveness in the global market. Both parties will cooperate with each other to increase their profits and contribute to the sound development of the industry. Each of the two parties will take advantage of its own characteristics, and perform corporate management steadfastly maintaining its own identity and system of responsibility.” Daihatsu thus took a new step as a Toyota Group member with its own “characteristics” in the field of compact cars, including mini vehicles. In April 1969, Daihatsu released a new 1,000 cc passenger vehicle targeting the common people, the CONSORTE BERLINA, as its first model since forming the business alliance. It was a sister model of Toyota’s PUBLICA, sharing some parts. 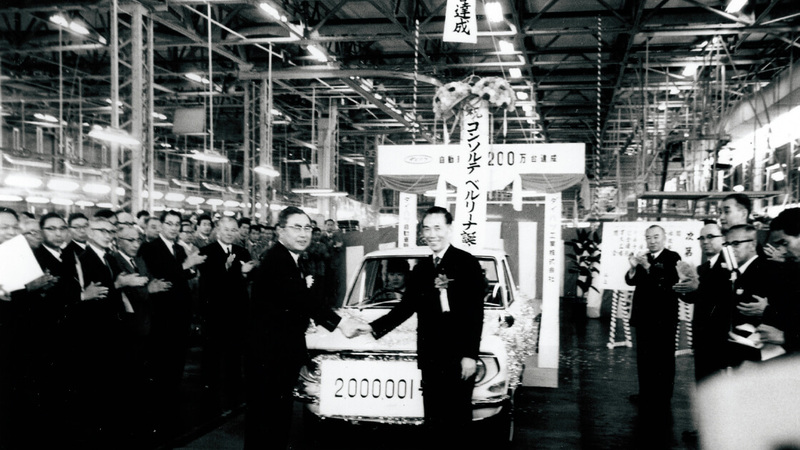 In September 1969, Daihatsu also started the consigned production of the PUBLICA to order at the Ikeda Plant No. 2 as one of the positive results of the business alliance. With the PUBLICA as the first example, to-order automobile development and production contributed immensely to stabilizing the management of Daihatsu. Subsequently, the business alliance with Toyota Motor continued to develop while adapting to changes of the times and the business environment. In 1998, Daihatsu became a subsidiary of Toyota, which acquired 51% of Daihatsu stocks, and then a wholly-owned subsidiary of Toyota in 2016, assuming responsibility for the Toyota Group’s small cars, including those produced and marketed in emerging countries. 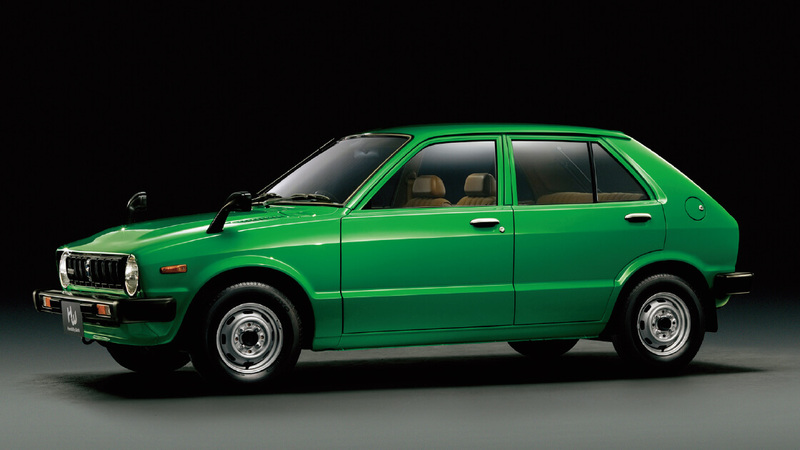 The CHARADE, released in November 1977, enjoyed an excellent reputation for its high economic efficiency and other features, and won the Car of the Year 1977 award, for the first time for a Daihatsu car. 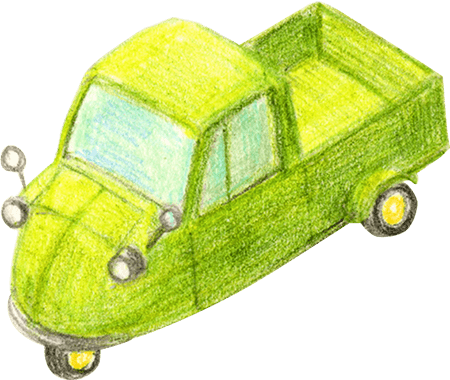 The CHARADE was developed under the concept of a “spacious but small, comfortable economy car,” and designed based on the principles of the “functions of comfortable cabin size and a gigantic run,” “compactness suitable for the traffic environment in Japan,” and “low fuel consumption and resource-saving features, matching the national condition and times.” The development team placed the highest priority on creating a “5 m² car.” At that time, Toyota’s PUBLICA was the only existing registered car with a 5 m² or smaller projected area. A spacious interior space in as compact a body as possible was a fundamental requirement to be met to achieve both comfort and economic efficiency, including low fuel consumption, at the same time. The development team began by defining the size of an interior space that could accommodate four adults, and then tried to make the body as small as possible, but such a small body was unable to accommodate the planned four-cylinder engine. Then, based on the proposal of some members to shift to a three-cylinder engine, the team began to develop an unprecedented engine for consumer-use passenger vehicles, and finally completed the compact but high-performance Model CB-10 three-cylinder engine, with a 993 cc displacement and a maximum of 55 horsepower. The development team succeeded in realizing a “5 m² car” by minimizing the size of the engine compartment with the newly developed engine installed horizontally. 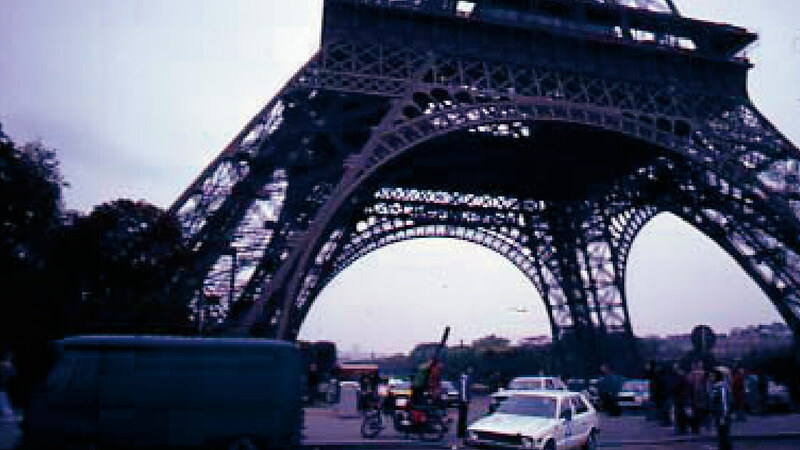 In 1983, five years after its launch, the CHARADE was remodeled completely. Being equipped with a Model CL engine, the world’s smallest one-liter diesel engine at that time, the new CHARADE embarked on a 10-lap nonstop drive around the Japanese archipelago on September 1, 1983, completing it in 117 days, thus demonstrating the reliability of the one-liter diesel engine. From the mid-1970s, many countries, mainly developing ones, adopted the policy of domestic automobile production one after another. 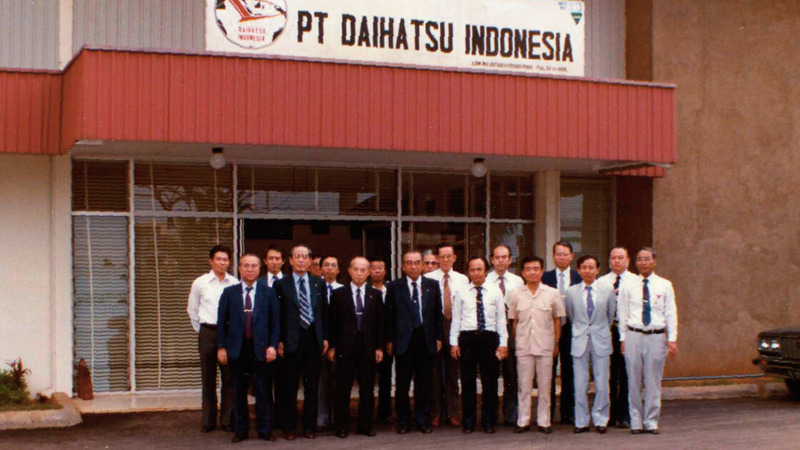 While exporting completed cars, Daihatsu promoted local knock-down manufacturing (manufacturing by assembling parts locally) to explore overseas markets according to the conditions of the target countries or regions. 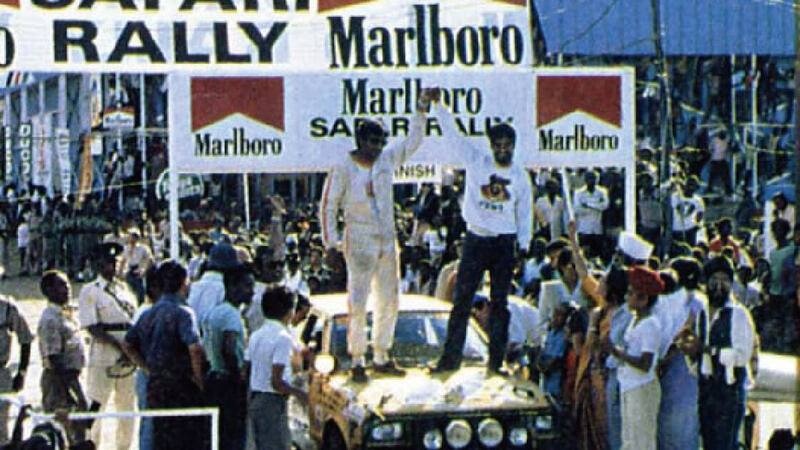 In such circumstances, in 1978, Daihatsu and Astra, a major Indonesian automobile manufacturer, founded P.T. Daihatsu Indonesia, a joint-venture company that would assemble mini cargo vehicle bodies in Indonesia. Before that, Daihatsu exported knock-down automobile parts to Indonesia, and had the parts assembled by Astra’s affiliated company. However, the Indonesian government promulgated the law to promote domestic automobile production in 1976, so automobile companies were required to locally procure bodies for cargo vehicles with a one-ton or smaller loading capacity from 1978. Since the mini cargo vehicle HIJET, Daihatsu’s key model, fell under this condition, Daihatsu had P.T. Daihatsu Indonesia take charge of automobile body production, including pressing, for the first time for an overseas local Daihatsu-vehicle manufacturer in which Daihatsu had a capital equity. 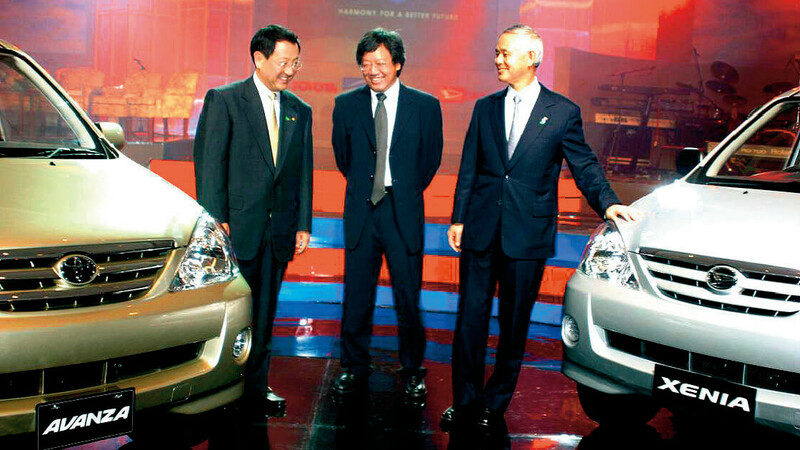 This experience helped Daihatsu immensely in further expanding its overseas business later. In 1983, Daihatsu joined hands with Nichimen Corporation (currently Sojitz Corporation) and local capital to found the joint-venture engine assembly company P.T. 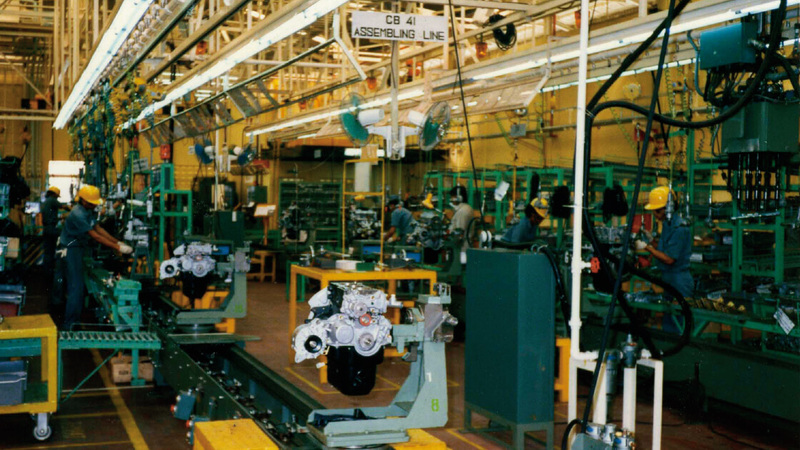 Daihatsu Engine Manufacturing Indonesia (DEMI), which initiated production in 1986. Such initiatives to promote local automobile production in Indonesia made the HIJET more affordable and more convenient for the local common people, resulting in the greater popularity of the model and assuring Daihatsu’s status as the best-selling automobile brand in 1984 and 1985. Following its early efforts in Indonesia, Daihatsu founded the joint-venture sales company Daihatsu (Malaysia) Sdn. Bhd. 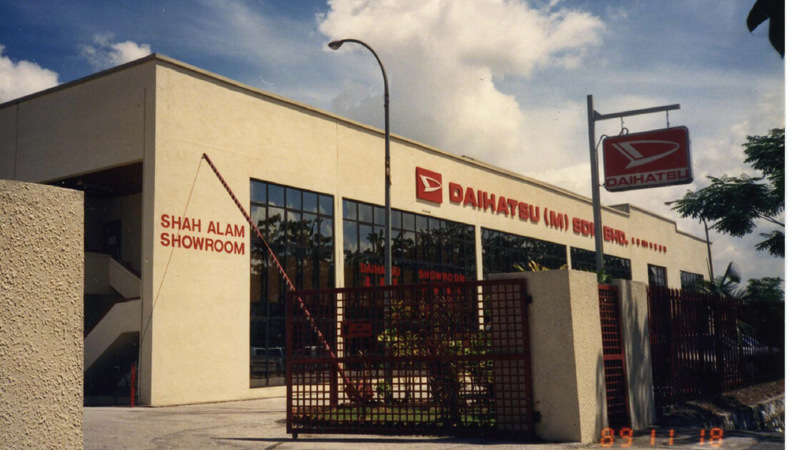 in Malaysia in 1980, aiming to enhance its sales capacity there. With already introduced knock-down manufacturing being further expanded, the sales company mainly marketed the CHARADE, the HIJET and the DELTA. After that, Daihatsu’s business in the two countries grew significantly into the cores for the company’s overseas strategy. 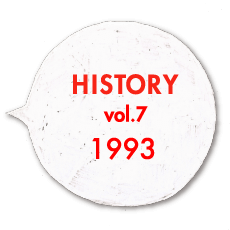 In the early 1990s, during the first few years of the Heisei Era, the country experienced the collapse of its bubble economy, as symbolized by the bursting of the prevailing myth that land prices would never drop. Demand for new cars began to decline in 1991, and mini vehicle sales in 1992 fell to 1.62 million cars, down 8.7% compared to the previous year, marking a two-consecutive-year decline. Daihatsu’s share of the mini vehicle market also fell to 25.1%, severely affecting the company’s management. Despite Daihatsu’s efforts to improve earnings and lower the prime cost, the further deteriorating economic environment, including the depressed market, prevented the company from producing a good result from such efforts. 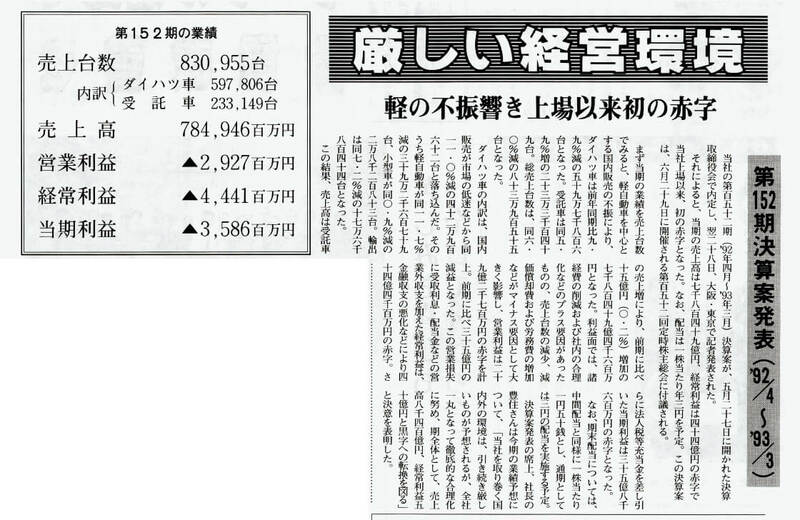 Although the company implemented various measures to cut costs, its unconsolidated results for the term ending in March 1993 were a current account deficit of 4.4 billion yen, and a pretax deficit of 3.5 billion yen. These were the first deficits the company had suffered since going public in 1949. To overcome the deficits as early as possible, the company drastically reconsidered the V21 Plan, the medium-term management plan that the company began to execute in 1991, and started implementing the N-V21 Plan in FY1992, aiming to fulfill the goals set in the plan in FY1996. 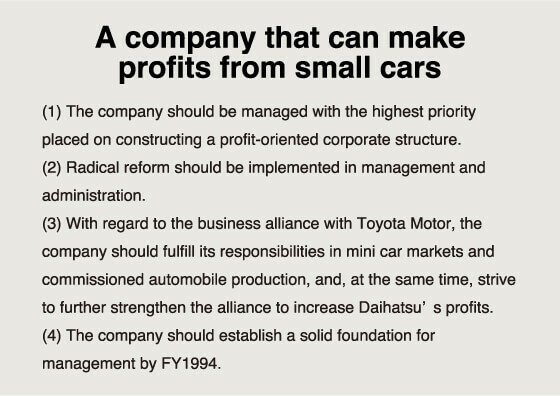 As a measure to shift to a profit-oriented corporate structure, Daihatsu established a Low-cost Vehicle Review Committee in 1993, to adopt an unprecedented approach toward cost cuts. The committee developed a reform plan, even recommending reform in the vehicle structure based on comparison with other companies’ cars, and proposed a review of the quality and technical standards. In addition, the corporate policy for FY1994 positioned the “promotion of activities to achieve super low cost” as the most important challenge, and defined additional activities through new projects. Although both the company’s sales output and sales amount in the term ending in March 1994 fell below the previous term, the drastic measures to improve earnings, including cost cuts, enabled the company to overcome the deficits in just one term. In the term ending in March 1997, the final fiscal year for the N-V21 Plan, the company’s current-account profit approximately doubled from the previous term, beating its record for the first time in eight terms. The fruits of the measures to change the corporate structure were reflected in such good results for the company. At that time (in 2006), the overall mini vehicle sales output in Japan established an all-time record of 2,030,616 cars, a 4.2% increase compared to the previous fiscal year, topping two million for the first time. In FY2006, just like the overall mini vehicle market, Daihatsu also set a sales record of 616,228 cars, a 4.1% increase over the previous fiscal year. The company accounted for 30.3% of the market, gaining the largest market share for the first time after long-term efforts to achieve the goal. This achievement, accomplished with the support of dealers, suppliers, and other related parties, filled employees with both delight and gratitude. Even though Daihatsu accomplished remarkable achievements in mini vehicle sales and business results fitting for the major anniversary, improving the corporate structure requires tireless efforts. 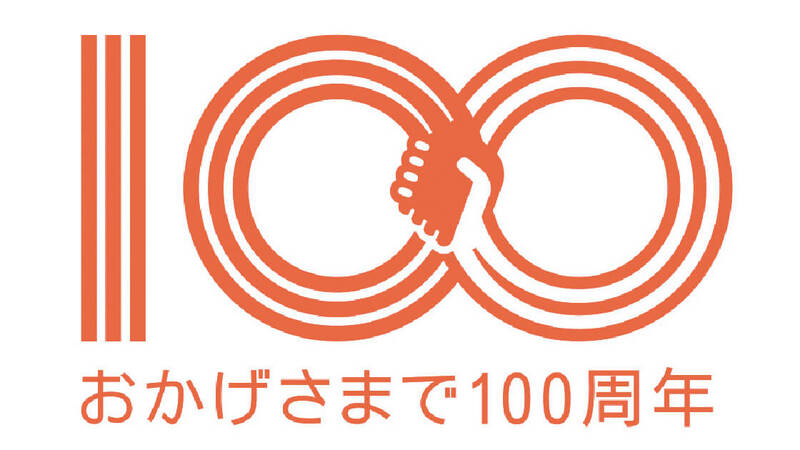 At the 100th anniversary ceremony, then President Minoura emphasized, “If we are to survive, and continue growing and developing over the next 100 years, it is essential for us to take the initiative in reforming ourselves,” marking a new start in Daihatsu’s endeavor to take up challenges through constant reform over the next 100 years. Daihatsu Motor, which operates as a brand manufacturer within the Toyota Group that specializes in the compact car business with a focus on mini vehicles, has advanced efforts to make structural changes to our company in order to establish a business model that can gain profits with mini vehicles. In 2007, full-scale operations began at the Oita (Nakatsu) Plant No. 2 of Daihatsu Motor Kyushu Co., Ltd., which at the time was the most advanced vehicle manufacturing plant in Japan. This plant was developed based under the key concept of SSC (Simple, Slim, Compact), and achieved an innovative manufacturing framework and outstanding productivity that enabled it to have about the same production capacity of 230,000 units as Plant No. 1, but at about half the building space and at only about 40% of the investment cost of this other plant. 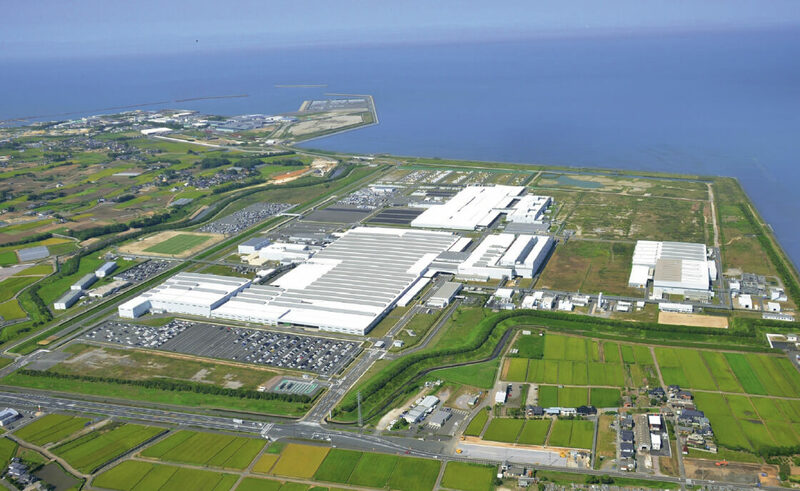 Entire view of Oita (Nakatsu) Plant of Daihatsu Motor Kyushu Co., Ltd. In 2011, Mira e:S was launched into the market as a vehicle with high fuel efficiency that runs 30 kilometers per liter of gasoline (JC08 mode), for the price that was about half of that of hybrid vehicles. It was promoted as the “third eco-friendly car” and became a revolutionary product that revalidated the raison d’être of mini vehicles. Meanwhile, from 2010, active safety systems including crash avoidance systems came to the public’s attention. Against this background, in December 2012, Daihatsu became the first to introduce a crash-avoidance assistance system called Smart Assist to the mini vehicle market, and installed this system in its highly popular mini vehicle, MOVE. By this, Daihatsu played a leading role in disseminating advanced safety devices to other mini vehicles and compact cars. In April 2015, Daihatsu launched Smart Assist II with enhanced functions, and in 2016, launched an even more upgraded Smart Assist III that included the use of stereo cameras and a new braking function for pedestrians. And in the overseas business, Daihatsu accelerated its efforts in prioritization and concentration, and advanced its business that specializes in the Indonesian and Malaysian markets. Daihatsu’s local affiliate in Indonesia, Astra Daihatsu Motor (ADM), started operating a new factory in 2012, and in 2013, launched AYLA, one of the strategic models built for Indonesia that received the approval of the country’s policy for promoting eco-friendly cars. In March 2017, the total vehicles produced at ADM, including OEM and consignments, exceeded 5 million units. It was the first among the automobile manufacturers in Indonesia to achieve this level of performance. In Malaysia, Daihatsu promoted reform of Perodua to enhance competitiveness, and established the Perodua Global Manufacturing Sdn. Bhd. (PGMSB) in 2012, which had its own new plant. New models for the local people were released one after the other, with AXIA launched in 2014, and Bezza launched in 2016. In 2016, Daihatsu made the decision to become a wholly-owned subsidiary of Toyota Motor Corporation. This decision was made so that the two companies could adopt a unified strategy and work closely with one another in the compact car segment, with a focus on emerging countries. This would help the companies achieve further sustainable growth on both sides and to develop ever-better cars for the two brands, which will ultimately help both companies to enhance their corporate value. 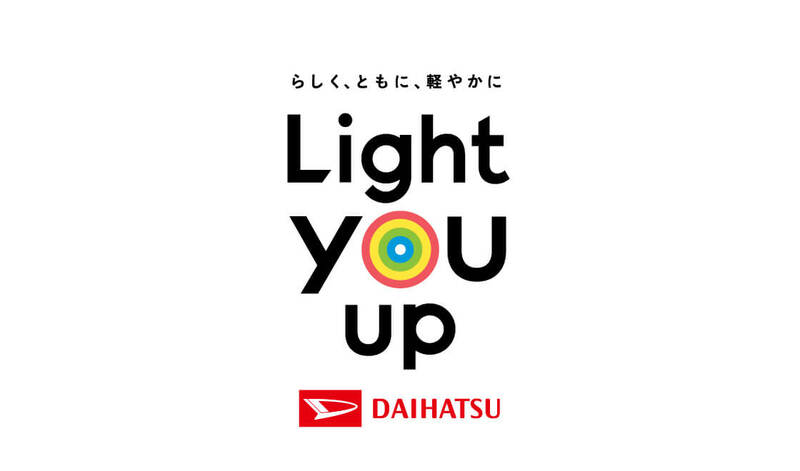 On March 2017, Daihatsu celebrated its 110th year since its founding, and took the opportunity of this commemorative occasion to adopt a new group slogan: “Light you up.” Daihatsu seeks to further advance the brand with this new slogan, because we believe that we will be able to light up the lives of individuals by providing products and services that place priority on the needs of each customer in the different local areas, while remembering to remain attuned to global market trends and technological changes. Based on this concept, Daihatsu will continue to pursue what makes this brand unique, and will continue its growth toward becoming a company that is considered as being essential to this world.